Active fun with a stimulating learning environment! Description: This has to be one of the best inflatables we have. Its a toddler units and perfect for kids 6 and under. It's 20 x 20 in size and features Micky and his friends. It also has a climb and slide area as well as other activities for kids to play with. 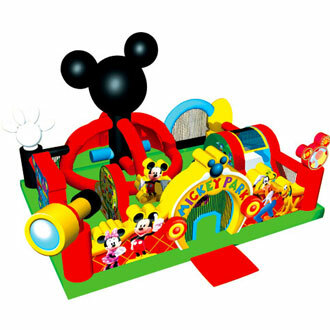 Call today to book the Mickey park learning club bounce house. see below for pictures and videos of the unit.